An early spring evening, a cozy fire burning in the hearth and award-winning wine from Australia’s Fowles Wines set the tone for a delightful evening at Australia’s High Commission on April 8th. The orig inal Fowles family ancestors settled in Australia in the early 1800s, having arrived from England and Ireland. The winery is now run by one of their descendants, Matt Fowles, who was formerly a successful lawyer. In 2007, Matt was selected to be part of the “Future Leaders” program that fosters a new generation of wine industry leaders for the country. This program is run by the Winemakers’ Federation of Australia and Wine Australia. It is Matt’s goal to see Fowles Wine become one of Australia’s finest cool climate wine producers. 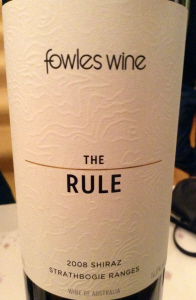 The 2013 and 2014 vintages have been award-winning for Fowles Wine, with numerous medals and honours, including Gold at the Sydney Royal Wine Show for “The Rule” Shiraz and 10 medals at the 2013 Victorian Wines Show. The winery is located in the Strathbogie Ranges, northeast of Melbourne. Ancient granite boulders dot the vineyards planted at elevations between 430 – 520 metres above sea level. The vines grow in quick-draining sandy loam soils, with winds that ensure good air circulation, thereby reducing risk of frost damage in early spring or mildew in summer. Weather conditions allow the grapes to ripen gradually, thereby accumulating intense flavour and colour. Lower rainfall and the quick-draining soils ensure that the happy vines have dry feet, resulting in low yielding, flavourful fruit. 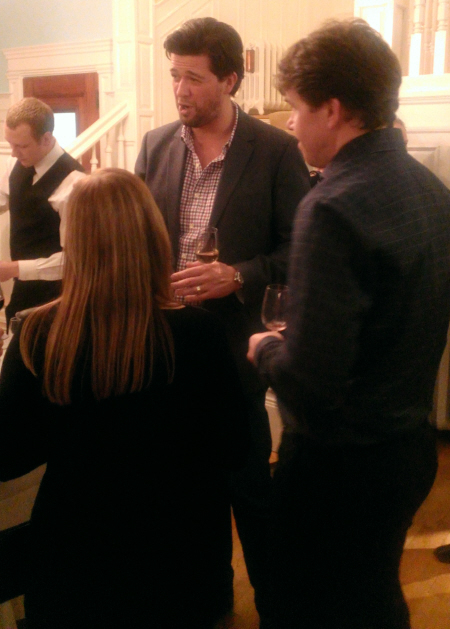 The vin eyard team at Fowles strongly believes that their terroir is linked to the quality of the wines they produce. Their vineyard management practices focus on sustainability. They use a computerized irrigation system to ensure efficient water use and reduce water waste. Natural bat guano is used, rather than chemical fertilizers and vines are sprayed with an organic blend called FKF (fish, kelp & filvic acid). Fuel use is monitored and reduced by using a new under vine mower and a double row canopy sprayer. The team continues to see improvements in their soil health in terms of increased soil organic matter. Regular pruning and minimal selected fungicides, including Australia’s first organic fungicide, also help. Sheep nibble weeds in the winter and the use of beneficial bugs and bacteria reduce the need for chemical sprays. Fowles Wines also runs the Cellar Door Café. The menu is based on sustainable food from their own farm where they use organic gardening principles in the two gardens. They also raise sheep. Fowles draws on vegetables grown locally in the Strathbogie Ranges region as well as wild game from that region. Matt calls this “Real Food.” He believes that responsible hunting is a more socially responsible and sustainable way to consume meat than obtaining it through mainstream means, such as the supermarket. Wild game, such as rabbit, hare, and pheasant, forage on wild grasses and herbs, so they are naturally more flavourful and leaner than commercially domesticated animals. 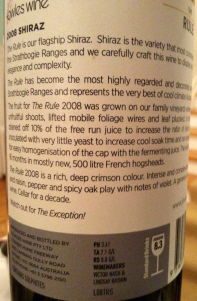 This “Real Food” philosophy inspired Matt to develop a line of wines – Ladies Who Shoot Their Lunch and Are You Game? – that complement these local foods. 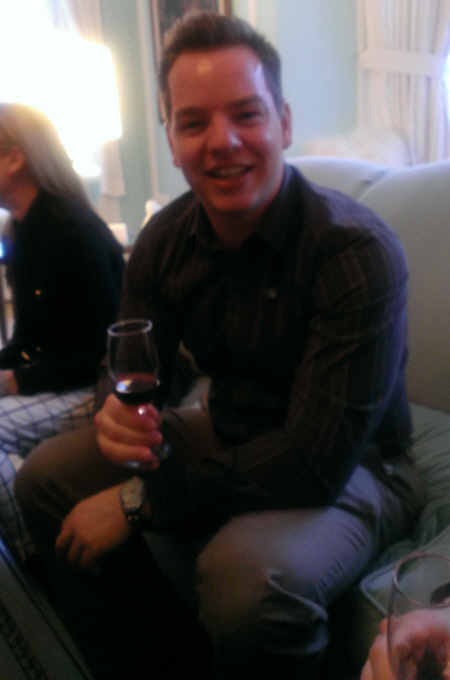 At the Australian High Commission on April 8th, Matt introduced us to these “Food Wines”. We first sampled the 2012 Are You Game? Chardonnay. A pale straw yellow, with a nose showing peach, papaya and lemon. The palate yielded tropical papaya and citrus, with very subdued oak to allow these fruity flavours to dominate. It has a creamy mouth-feel due to 10 months spent on yeast lees, followed by a long tropical fruit finish. It was a delightful match with the Trout Escabeche that we were served and a perfect interplay with the spicy shrimp that came along next. Then we happily sampled the 2010 Are You Game? Shiraz. This deep red wine was very perfumed, with notes of ripe cherries, earthy minerality and spicey notes of cinnamon, nutmeg and subtle oak. The palate was intense but not heavy, with spice and blackberries and ripe black cherries intermingling. Oak was present but as a background to the fruit and spice. Well-balanced with a long, satisfying spicy fruit finish. It was an instant hit with the lamb sliders that followed. The next wine was the 2010 Ladies Who Shoot Their Lunch Shiraz, developed to complement wild game. An opaque ruby-coloured Shiraz with aromas of blueberries, blackberries and red plums, with minerality and forest floor elements, vanilla and subtle spice, less spicy than the Are You Game? Shiraz. The complex palate was a finely woven interplay of blueberries and ripe red plums along with vanilla and spice, in a very smooth mouth-feel with finely balanced tannins. A long, peppery plum finish completed this terrific selection that beautifully complemented the Elk that was served with it. To finish the tasting, we were introduced to the 2009 Stone Dwellers Cabernet Sauvignon, from the Strathbogie Ranges, a wine from Fowles’ “Regional Wines” line. This opaque dark garnet red wine is fragrant with ripe raspberries, dark red stewed fruit, smoke, oak and pepper. The palate gives ripe dark berries, oak, spice, smoke and a hint of mint. Well-balanced, gentle tannins. There’s a lovely long ripe fruit finish with a final touch of mint. This is a Cab Sauv that is more fruity though less jammy than many others and it’s definitely one that you can enjoy with food or savour on its own. 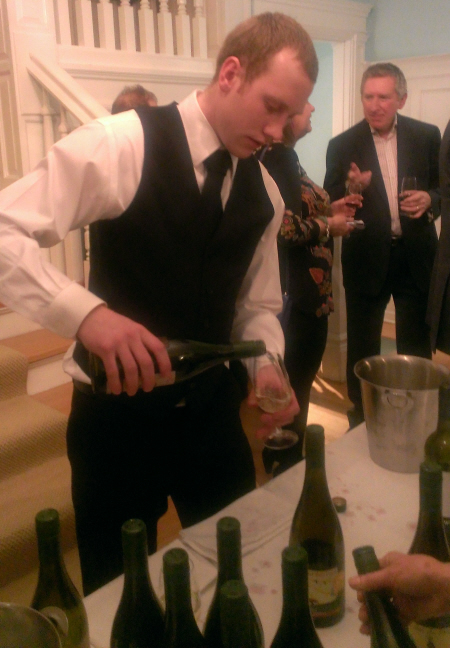 The Australian High Commission has once again graciously hosted an evening that was a food and wine delight. Highly informative, too, with issues such as Sustainable Wine production and Real Food to feed our minds as we set back out into the spring sunset. She completed courses in Winetasting, Grape Varieties, Food and Wine Pairing, Old World Wines, New World Wines, Vinification and Advanced Sommelier Techniques. She also has a Bachelor of Arts from the University of Toronto. Jane is one of the most active wine reviewers for nataliemaclean.com as well as for her own site, bellovino.ca. Along with Shirley Plant, Jane the co-authored the book Finally…Food I Can Eat! She provides the wine pairings for the recipes as well as occasional articles for Shirley Plant’s blog. She also provides sommelier services and tastings for private functions, and is fluent in English, French, Spanish and Italian. In the video above, Matt Fowles chats about pairing his wines with game dishes. Her Excellency, Louise Hand, Australia’s High Commissioner to Canada, warmly welcomed a group of Ottawa-based wine-lovers to her official residence to introduce to our community Matt Fowles of Fowles Wine (www.fowleswine.com) which included a special tasting of several of Matt’s award winning wines. 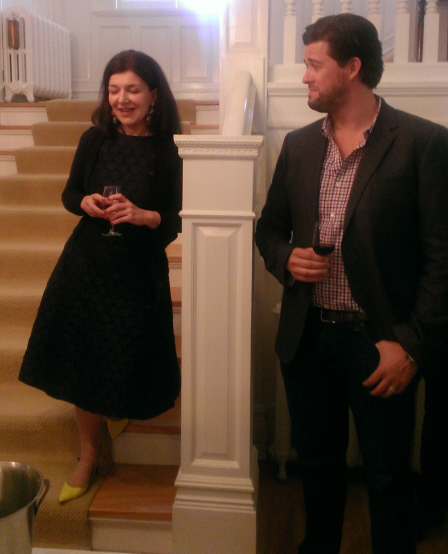 The High Commissioner spoke highly of Matt’s wines; in fact, she pours his wines for her most special occasions, including her Australia Day function; and, most notable, her choice wines for her birthday are “Ladies who Shoot their Lunch” – one of Fowles Wines more premium offerings. Mental note: Get invited to her birthday party – yet proceed with caution if invited to lunch. 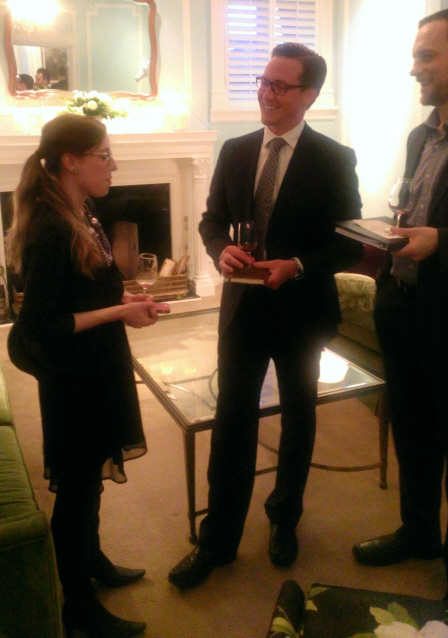 The High Commissioner’s genuine passion for Fowles’ wines speaks to the quality and uniqueness of this cool climate Australian winery. Cool climate? and Australia?…yup! Victoria is mainland Australia’s most southern and coolest wine growing region. Not as cool perhaps as Canada’s cool climate regions; however, quite different from many of Australia’s warmer wine growing regions. As soon as we began tasting it was clear that these wines were unlike what many may believe ‘Australian wine’ tastes like. The provenance of his wines was clearly a cool climate. Absolutely no jam or over expressed fruit, but rather a nice balance of delicate fruit with refreshing acidity that begs for a complementary food pairing. And that’s exactly what we did! The resident chef served-up an array of delicious appetizers that wonderfully complemented the wines, such as elk sliders, salmon with caviar and grilled prawns. Matt’s wines are known for their food-friendliness, and they lived up to their reputation. To highlight this, Matt said their sole focus with the Ladies who Shoot their Lunch and Are You Game labels is to create wines that pair with food, and more specifically with game. They’re on to something with these wines. The herbal elements, present but restrained fruit, expressive minerality, and terrific structure, are exactly what you want when pairing wine with game, or food in general. Australian Shiraz pairing does not have to be limited to sweet and tangy BBQ fare. In fact, I’m seeing more Australian producers move towards producing stylistically very different wines than they did only a few years ago; wines that should be enjoyed with food, but taste great on their own too. This is a very welcome change in my opinion. Matt went on to explain how their vineyards located in the famous Strathbogie Ranges are peppered with massive (~440 million year old) ancient granite boulders (older than France’s soil), and how the relatively arid climate and ancient soil helps stress the vines to search deep for water and nutrients – key ingredients for producing interesting wine. Fowles Wines are also proud sustainable farmers. No harsh chemical sprays in their vineyards. Combine the unique ancient soil with the cool climate and they’ve got a recipe for producing low yielding high complexity fruit, and the evidence is in the bottle. The list of impressive awards they’ve received is further affirmation of the good things happening at Fowles Wine. One of Fowles Wine’s most impressive awards was when they won the Great Australian Shiraz Competition in 2010 and the winemaking legend, Steve Henschke (producer of one of Australia’s two iconic wines “Hill of Grace” – http://henschke.com.au), presented the award to Matt and his team. Being recognized for producing Australia’s top Shiraz, in a competition with far more storied and expensive wines, was the confirmation that they were on the right track. Furthermore, that award marked the first time a Victorian winery had won the coveted Great Australian Shiraz Challenge http://www.shirazchallenge.com.au – an award that Fowles Wines remains proud of to this day and rightly so. If you haven’t tried any of Matt Fowles’ wines, then give them a shot and enjoy a refreshing style of Australian wine that perhaps you’ve never had before. Sommelier Tip: If someone asks you what wine to pair with game, now you’ve got a couple great (and readily accessible via LCBO) options to offer up. Matt Steeves, is an Ottawa-based accredited sommelier and co-founder of Quercus Vino (@Quercusvino). 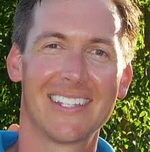 A passionate wine-enthusiast, Matt has visited many of North America’s wine regions which has given him an appreciation for the stylistic differences that each region’s unique climates and soils can produce. Matt is an avid supporter of the growing Canadian wine industry and is proud to say there are world-class wines being produced in each of Canada’s major wine making regions. The second part of our conversation with winemaker Matt Fowles.